GRAND CHUTE, WI - The Wisconsin Timber Rattlers are unveiling a 25th anniversary logo for the 2019 season. The Midwest League affiliate of the Milwaukee Brewers began play in the Midwest League in 1995 and next season marks their silver season. 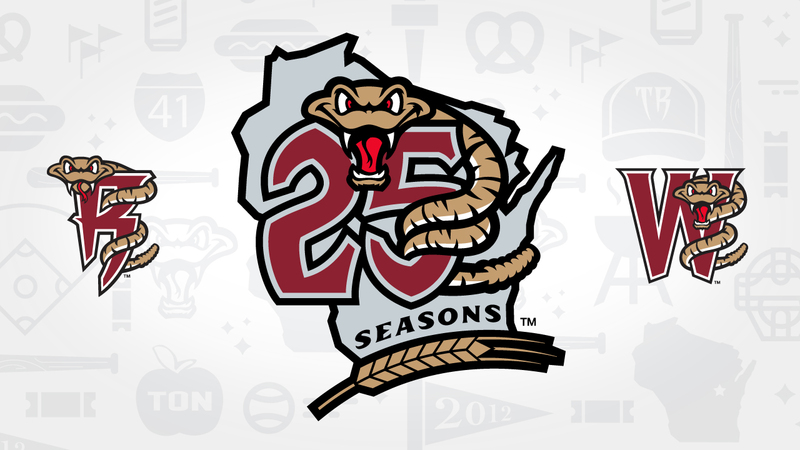 The logo features the number 25 and an outline of the state of Wisconsin with a Timber Rattler wrapped around the '5'. "We are excited to celebrate our 25th season as the Timber Rattlers next year and can't believe how fast the time has gone," said Timber Rattlers president Rob Zerjav. "It was quite the leap of faith to build this stadium and rebrand the team back in the 90's and to see what this organization has grown into is pretty amazing. The Timber Rattlers are ingrained into this community and we look forward to seeing everyone at the ballpark next season, hearing their stories from past games and making new memories moving forward." The 25th anniversary logo is not the only new Timber Rattlers logo for 2019. They revealed new logos last week.